Despite opening a second Aldi in the neighborhood along Lake St., the company does not plan to close the Aldi a few blocks away at the Hi-Lake Shopping Center, according to the owner of both buildings. The former Rainbow Foods at 2912 28th Ave. S. has been transformed into a brand new Aldi with wider aisles, more refrigerated items and a wider selection of fresh foods. According to Wellington, Aldi plans to continue operating the store nearby at the Hi-Lake Shopping Center in another building managed by Wellington. “We know of no plans to close it,” he said. 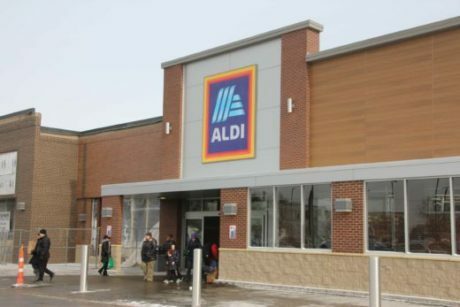 Aldi is in the process of revamping its stores, but was not able to redo the store at 2100 E. Lake St. because “the building footprint, access, and layout were not conducive to the significant modification that was required,” stated Wellington. Aldi is part of a second phase for redeveloping the site. There is additional retail space for lease next to the grocery store. The first phase was the 19,600-square-foot, second-story addition built on the back side of the building for the K-8 Universal Academy Charter School. The third phase will include 110 units of affordable housing for seniors and 15,000 square feet of retail space on the ground level. The construction of this mixed-use building on the northwest corner of the parking lot is behind schedule as Wellington Management works to put the financial pieces together to make it affordable. The Rainbow site, Cub land and Target property together represent the second largest piece of continuous asphalt in the city of Minneapolis, pointed out Wellington. They have worked to align their project with the the city’s plans for greater density in the area due to the nearby lightrail line.